Jobs are growing in New York. So is the cost of living. Communities are displaced, identities are uprooted. New York City has added 500,000 private sector jobs in the last five years, the fastest rate of growth since such statistics have been collected in the 1970s. Most of these new jobs are in Manhattan below 59th street; however, there is also significant job growth in places like Long Island City, Williamsburg and Downtown Brooklyn. These are also neighborhoods that have seen a steep escalation in the value of land and the overall cost of living, leading to a growing displacement of the working population. But does growth have to mean displacement? Is there a way to encourage job production while distributing the value increase in the cost of land to the working people in the neighborhood? Gowanus Brooklyn grew from swampy pasturelands into an industrial center in the 19th century. Today, the federal and city governments have pledged over $500 million to clean up the polluted canal. DLand studio has produced a dynamic vision of climate adapted open space. Capitalizing on this investment and 2010 rezoning, the Lightstone group recently opened 700 units of housing (20% affordable) on the banks of the canal. A one bedroom rents for about $3500/month. The construction of residential properties and associated neighborhood services increases the cost of land, encourages the assemblage of parcels for redevelopment and that leads to the loss of jobs. Rent stabilized housing in or near manufacturing zones is threatened by the increasing value of land. Current zoning policies and real estate forces produce a very specific pattern of development: a monoculture of a single-use profit-making engines for the ones who can invest in them. Is there a way to grow with greater equity? Designations of residential, commercial and manufacturing districts do not convey the organic mix of live and work happening in New York City neighborhoods. For one thing, zoning is enforced through construction permits and there is no mechanism to track the illegal or non-permitted conversions. Buildings used to be more like Venturi’s “duck,” now they are mostly “decorated sheds.” And zoning use designations are anachronistic. Separating zones based on use was originated as an effort to separate housing from noxious industries. Today, zoning is seen by many as a means to protect people against noxious real estate values that are driving out small businesses and longtime residents. What would the physical forms and regulatory norms for small businesses and local wealth generation look like? Mx.org explores the idea of contemporary industrial commons and the potential of new building typologies and zoning regulations that can support the growth of small businesses in areas facing rapid growth. Mx.org is a design research project that focuses on the ways design can empower local communities to become stakeholders of their future. Focusing on the Gowanus, Mx.org proposes a new way of governing and implementing through a new model for development and consequent building typology. From profit-driven development, to mission-driven growth. The new zoning district aims to shift the future of neighborhoods from profit-driven development, to mission-driven growth. Every new construction would have to be developed and maintained by a mission based non-profit entity. These non-profits would have to adhere to citywide performance standards for the protection of jobs. The non-profits would operate as a limited equity co-op, allowing small businesses to own a stake in the success of their community. Prevent big, embrace small: maximum lot size. In some instances, zoning has recommended a minimum lot size in order to exclude certain types of development. Mx.org proposes a maximum lot size of 5,000 square feet, with some exception for qualified anchor employers. This would discourage assemblage of large parcels and allow more players to share in the inevitable increase in the value of the land. Don’t accumulate, share: minimum unit count. By requiring a minimum unit count mx.org intents to diversify and distribute wealth to a number of business owners from the beginning. Each new construction would be required to have a minimum unit count of 20. After five years, units could be combined to allow businesses to grow, but only by permission of the co-op board and only two at a time. Decide, permit and monitor the use locally: local use regulation. Moving away from the notion that zoning itself should mandate use or performance, mx.org proposes a local use regulation by the non-profit. The entity is responsible for the permitting and monitoring of uses within their property, adjusting to the needs and the flexibilities of the specific community. They would work with local entities such as Community Boards or Business Improvement Districts to set local standards for noise, loading/truck trips, waste removal, and emissions--all within the boundaries set by a public review process. Building code, fire safety and other environmental regulations would apply, but the zoning itself would not mandate use or performance. The industrial commons: public circulation + service core-t-yards. Mx.org introduces the industrial commons: public circulation + service core-t-yards. A public circulation system would be provided in the front court. A second means of egress, utilities chases, and a winch for the hauling of goods would be provided in a rear service core. Each development would be required to have a minimum 20% of the of the ground floor for a “service” area which would extend to as many units as possible and include a 10’ shared easement along the rear lot line for vehicles. The contiguous easements would form an alley, which would be shared and managed by agreement of the owners. Each development would also have a minimum 15% of the lot area dedicated to a front court, open to the sky and fronting for at least 10’ along the public street. This front court would provide frontage and a semi-public open space for each unit. These courts would not be permissible for residential, commercial or community facility building types, but zoning does not limit courts in manufacturing buildings. Understanding the importance of scale and the need for support, each block in the district would be allowed to have two anchor employers that need not comply with the minimum lot size and unit count. These anchors would have to meet a local standard for wages and a number of employees. The anchors will benefit the smaller businesses by providing potential markets. For instance, a film production studio could contract locally for catering, carpentry, and hair and make-up. They could also sublet additional space from their neighbors for short periods as needed. Mix and match and grow! This model of development would provide a diversity of unit types for small businesses. Units on the ground floor would be great for retail while the upper levels would be great for artists. The front courts would provide a dynamic public space where small businesses and artists could have both a permanent home, a collaborative community, and a built in market. The back service areas would provide a shared, private space reserved for loading, unloading and other back of house operations that make businesses work in the city. 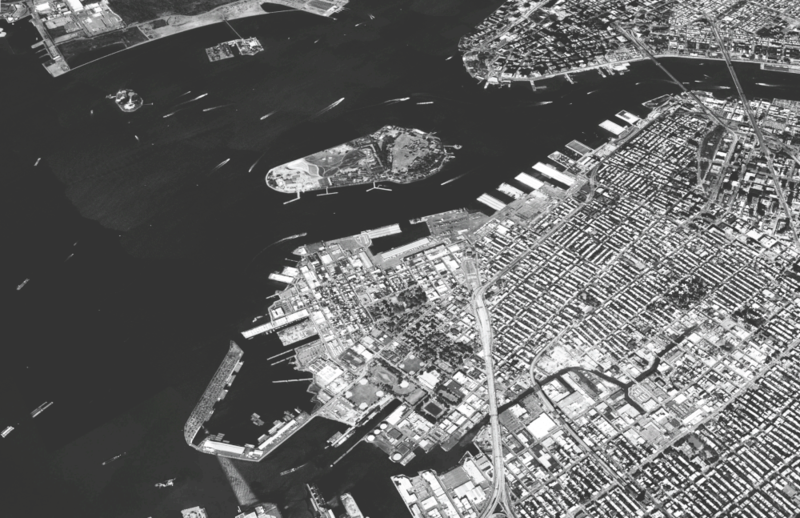 Bridging Gowanus, a recent planning effort led by the local Councilman’s office, urges designers and policymakers to protect industrial jobs while maintaining and adding affordable housing. Mx.org suggests that these goals are both possible and entirely compatible, if we rethink the laws of growth in our city.